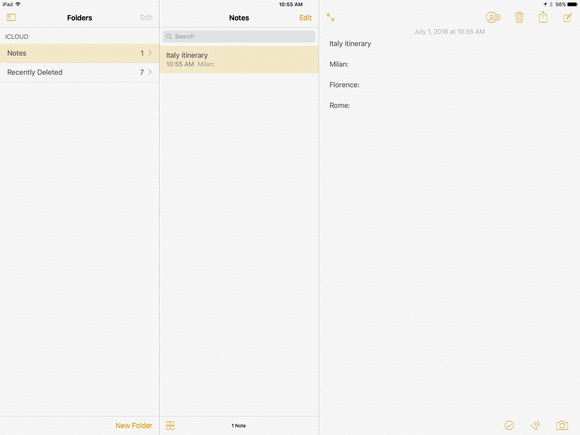 Minor but necessary tweaks are coming to the iPad this September. Here's a sneak preview. The iPad Pro is a productivity powerhouse—or at least, that’s what Apple wants it to be. The 12.9-inch Pro was released last November, and the 9.7-inch model debuted in March, so we weren’t expecting to see any new hardware at Apple’s Worldwide Developers Conference in June. But we were hoping Apple would add some iPad-only features in iOS 10 that would fix a few problems and make the Pros even more awesome, or at least show off some new partner apps that take advantage of all that screen real estate. Alas, the iPad was a footnote in iOS 10’s parade of features. The device gets most of the good stuff, like the revamped Messages app, a new lock screen with rich notifications, and smarter Photos, but the iPad-only tweaks are just that: minor changes. I really dig the giant iPad Pro, but not a lot of apps make good use of that massive display. 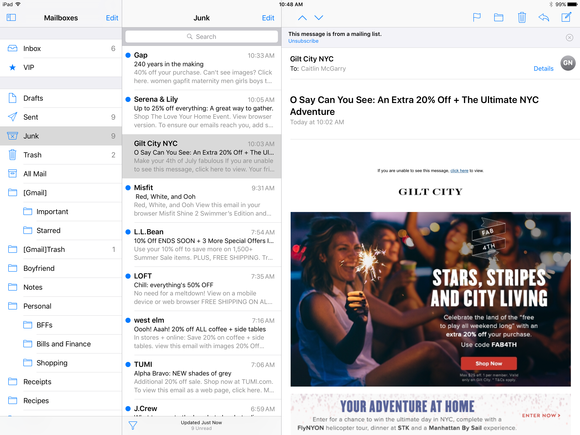 iOS 10 brings a three-pane interface to Mail and Notes on the 12.9-inch model, and it’s so useful that I hope Apple will open up that functionality to developers so I can have the same multitasking abilities in Outlook. To view all three panes, turn your big Pro from portrait to landscape mode and tap a new multi-pane icon on the top left of your screen and watch the app expand. You’ll only see this icon in Notes and Mail, and only on the 12.9-inch Pro. If you have a lot of email to wrangle or a slew of notes in various folders (as you can see below, I clearly don’t), the new view will go a long way toward helping you stay organized. 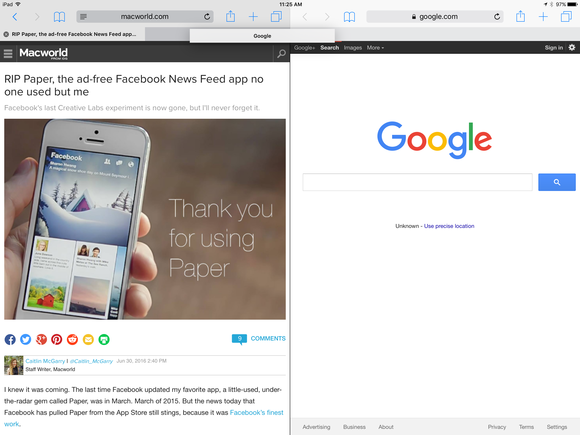 Multitasking on the iPad Pro is supposed to be easy. But one way I multitask on my Mac is by having a few web browser windows open at once so I can compare notes without toggling between tabs. Now I can easily do that on the iPad with Split View for Safari tabs, new in iOS 10. 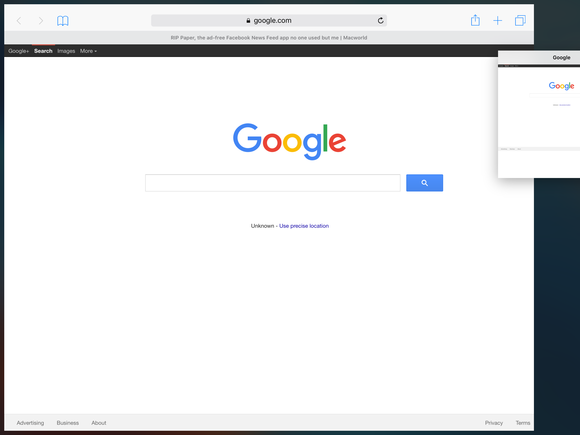 How it works: Press and hold the tab you want to put in its own window, then drag it to the left or right side of the screen. The original window will shrink and a grey space will appear next to it. Drop the tab into the grey space and it’ll expand to fill half the screen. 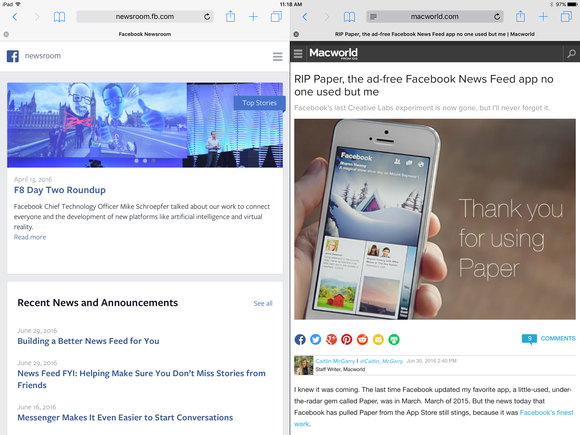 When you’re done with Split View, grab the bar and move it back to a tab in the main window. When I first discovered the new Split View support in the iPad version of the Music app, I thought: Who needs this? 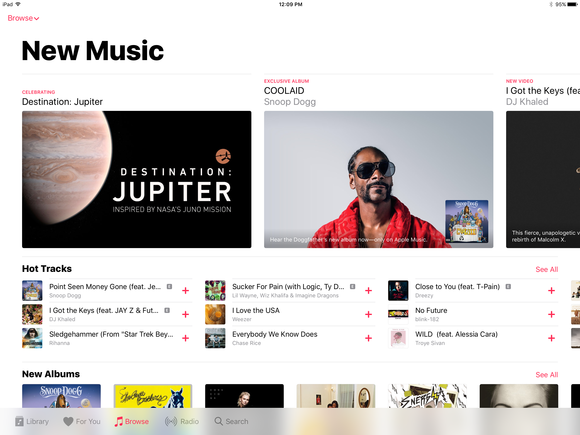 Well, if you love music and are constantly researching new artists, albums, and songs, being able to search for tunes in the Music app while reading reviews or music reviews on Safari is incredibly useful. 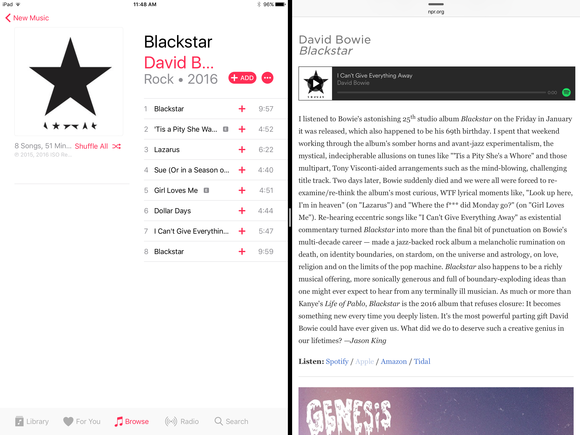 For example, I was browsing through NPR’s list of best albums of 2016 (so far, at least) with Apple Music open in Split View. Tapping on each album’s Apple Music link would pull up the album right next to the Safari article, so I could easily save records I hadn’t listened to yet to my library or play them on the spot. 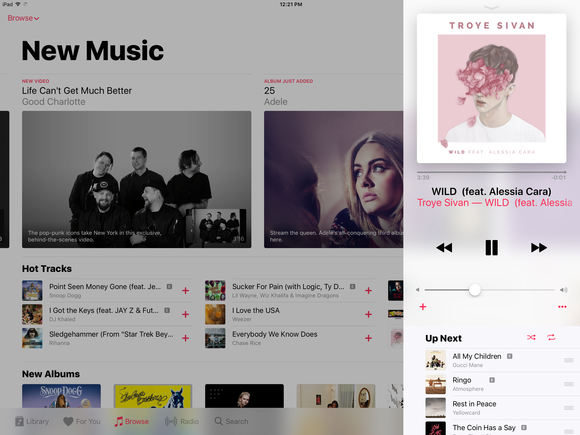 Apple redesigned the Music and News apps for iOS 10 with an emphasis on interface simplicity and bigger, bolder images and fonts. Those apps are optimized for the iPad, and as you can see, bigger is definitely better. The iPad Music app puts the navigation bar on the bottom left and your Now Playing bar on the bottom left, so you can easily toggle between your library, recommended playlists, and new music while still seeing the song that’s currently on. Tapping on the Now Playing bar will bring up the Now Playing window as a transparent overlay on the right third of the app, so you don’t have to navigate away from the main window to view more information about the song, save it to a playlist, or see what’s coming up next. News looks dramatically different in iOS 10, too. 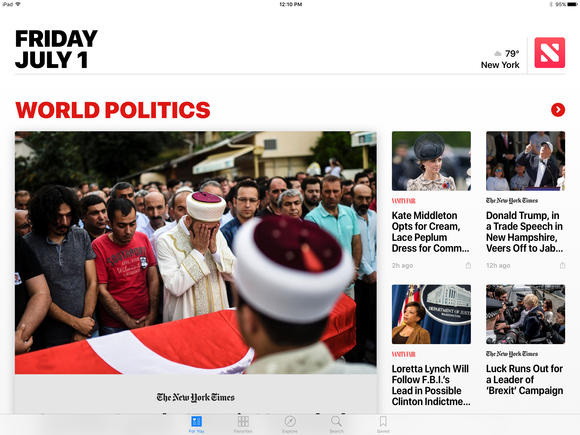 I prefer to browse through publications like the New York Times on my iPad instead of my iPhone, and the new navigation tabs and super-sized images look amazing on the 12.9-inch Pro. 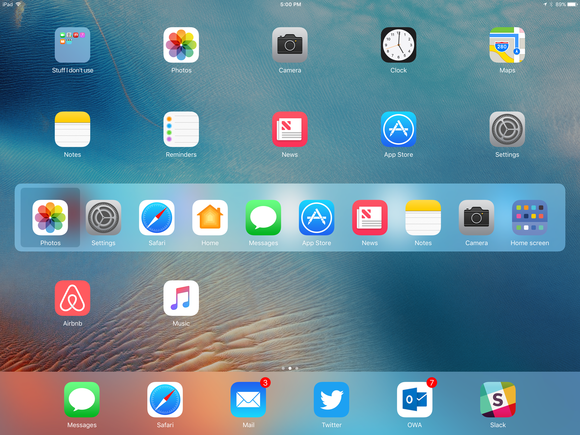 When you wake your iPad in landscape mode, you’ll notice it looks a little…funny. All the text has been forced to the left, as you see. Why is that? 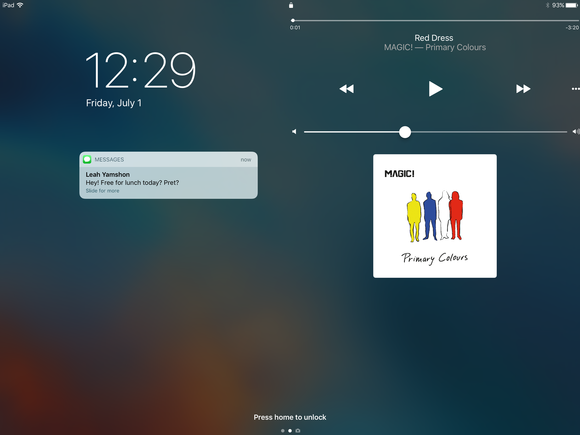 Well with iOS 10, your iPad lock screen will display rich notifications to the left and any media you’re playing on the right. It’s an easy way to see all the information you need without even touching your iPad. 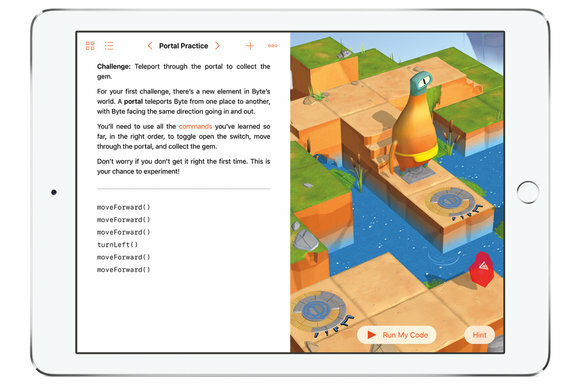 We’re doing a deep dive with Swift Playgrounds soon, but this iPad-specific app coming in iOS 10 is designed to teach kids or beginners how to code in Apple’s Swift programming language. The app even has a specific coding keyboard for shortcuts and Swift characters. The code you write in Swift Playgrounds can be exported as Xcode and turn into a real iOS app. Stay tuned as we put this app through its paces in an upcoming piece. iOS 10 finally makes your iPhones and iPad integral to controlling your HomeKit accessories with the launch of a new Home app. The app works across iOS, tvOS, and watchOS, so you can control your connected home from anywhere. The Apple TV is the perfect device to control your home, but if you have an iPad that never leaves your house, it too can serve as the central HomeKit hub for your family with iOS 10. Open your iPad Settings and make sure iCloud keychain is turned on, then stay in Settings and tap on Home. There you’ll see the option to use the iPad as a Home hub. Toggle it on. Then you can add HomeKit accessories and arrange them by room. We’ll do a deep dive into how this works in a future piece. Now you don’t have to buy an Apple TV or a third-party hub (and install all those manufacturers’ stand-alone apps) with iOS 10 on the iPad. There are two new minor shortcuts for iPad Pro users with Smart Keyboards that will make life a tiny bit easier. Now when you tap Command+Tab on the keyboard to pull up the app switcher overlay, there’s a new home screen option on the far right to navigate back to the main screen. The second is a feature that lets the Pro mimic the Mac: Press Command-Shift-3 on the keyboard to take a screenshot on your iPad. 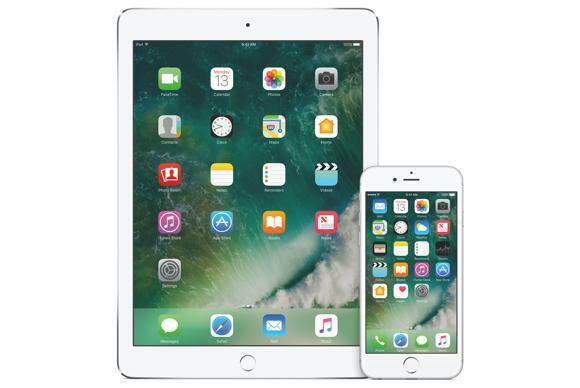 It’s likely the iPad, particularly the Pro models, will see improvements in dot releases of iOS 10, if not the first version that rolls out in September. We’re hoping for a search tool in the Slide Over sidebar, among other things. Have you found any other iPad-only tweaks in iOS 10? Share them in the comments.